Where is Dow Jones heading next week ? 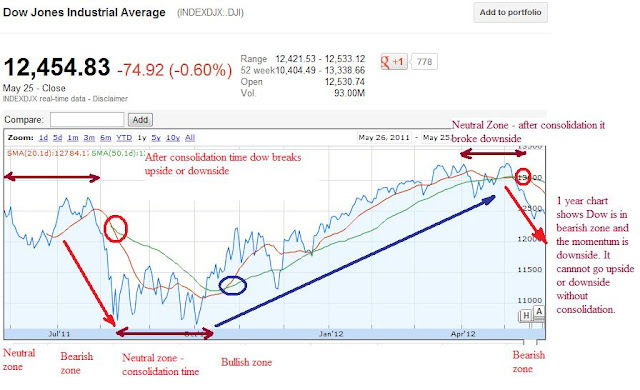 This article is continuation of "Where is Dow heading?" 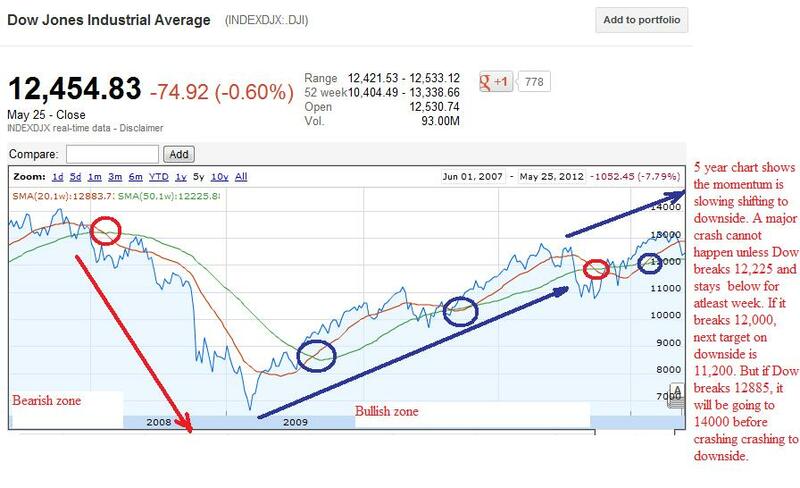 http://www.freefdawatchlist.com/2012/05/where-is-dow-jones-industrial-average.html This week we saw consolidation in Dow between 12339 and 12570 range and it gained 85 point. Bulls are hoping for recovery, while bears are hoping for major crash. But none of this is happening soon. Dow is still in consolidation zone and it can break either upside or downside, but the upside target is 12570, while downside is 12,215. Lets see how chart looks on daily, monthly, and yearly basis. 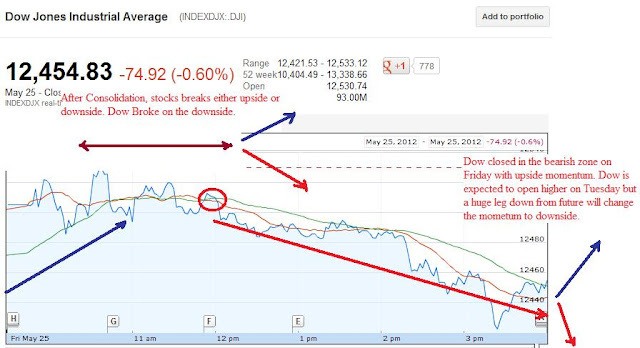 Dow May 25th: Dow maintained upside momentum at the open on Friday, which was set by late afternoon rally on Thursday. 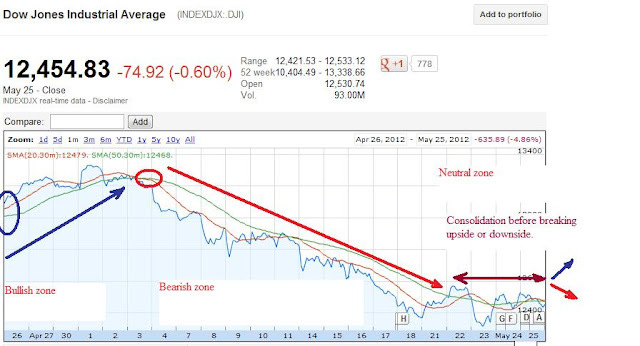 At the close, Dow was in the bearish zone with upside momentum. Market is closed on Monday. Based on the chart, Market is expected to open higher on Tuesday with upper target of 12,490. 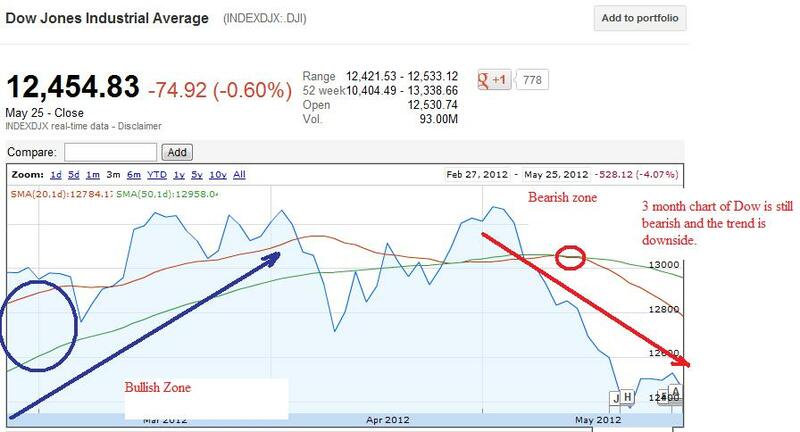 But a huge leg down from future will change the momentum in bearish zone and downside target is 12,375. ECB is again printing money on May 29th. Last three time, we saw sell off inspite of ECB printing money. Dow is expected to open higher on Tuesday with upside target of 12490 while a huge leg down from future can change the momentum in favor of bears. 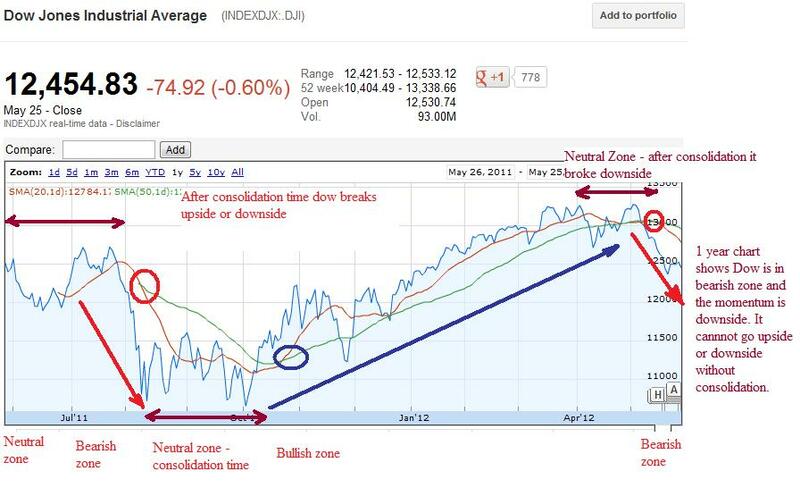 1 month chart of Dow: shows it's in consolidation zone and after consolidation either it can break upside or downside. The chances of downside is higher in coming month. 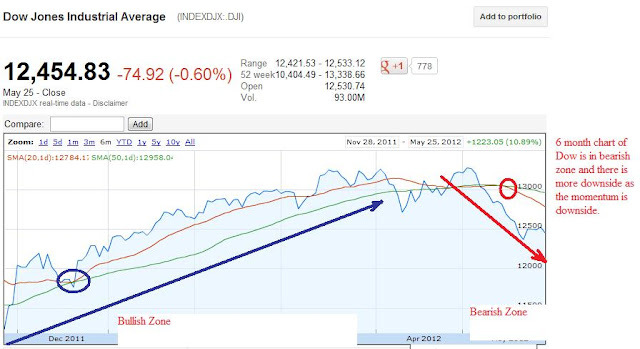 3 month chart of Dow: shows the momentum is in the favor of bears, and there is still room for downside. 6 month chart of Dow: shows momentum is downside and dow is likely to fall below 12000 in coming month. 1 Year chart of Dow: shows if Dow breaks 12000, it could slide as low as 11,200 If the slides continues it can go max 10673 where it has major support. 5 Year chart of Dow: shows its shifting momentum slowly toward downside. Next week, I am expecting another consolidation week between 12,215 and 12570 range. The trend is still in favor of bulls as US dollar index is at 82.40 at 1 year high and Euro is at two year low. In a similar situation, we saw central bank's of USA, Japan, Canada and Europe intervening together in the market in November which lead to 1000 point rally. There is only one reason to be bull. The other scenario is central bankers won't intervene till Greece future is decided. They know if Greece exit Euro, its going to bring major disaster in this market which favor bears. Greece election is on June 17th. If the election result remains undecided, expect major sell off in this market. Spain is on the path of joining Greece and becoming headace for world economy. Spain 4th largest bank is on the verge of bankruptcy. Spain unemployment is at 25% which will make any recovery in Spain very difficult. US, China and Europe economic data are showing slow down. Bank downgrade is still coming. So there are more reason to be bear. My suggestion would be sit on the sideline and enjoy the show or play on the daily basis. Cash is the king. Wait for the right time to invest in this market.